As recipients of federal funds, the City and Port of Oakland have an obligation under Title VI of the Civil Rights Act to avoid causing an unjustified unequal impact on the basis of race. The City and Port of Oakland have consistently ignored federal protections against discrimination, leading to toxic air and unhealthy burdens for West Oakland residents. The West Oakland Environmental Indicators Project has filed a complaint under the Civil Rights Act of 1964 describing a pattern of conduct by the City and Port of Oakland that inflicts unjustified and unequal impacts on the historically black community of West Oakland. For decades, the City and Port of Oakland have issued approvals to expand polluting freight activities in West Oakland while ignoring input from the community, betraying a deep disregard for the health of local families. That pattern continues to this day, causing West Oakland residents to suffer from diesel emissions that are up to 90 times higher than California’s average. Earthjustice is representing the West Oakland Environmental Indicators Project in the complaint. Filthy diesel-powered freight is harmful for the lungs and hearts of West Oakland residents, especially for children and seniors. Gasping asthma attacks send West Oakland residents to the emergency room at almost twice the Alameda County rate. Children are especially vulnerable to asthma, and living with terrible air quality can stunt their lung development. The pollution in West Oakland’s air cuts into not only quality of life, but also length of life. Air pollution also contributes to higher rates of heart failure and strokes in West Oakland by causing blood clotting and cell damage. According to the Alameda County Department of Public Health, residents in West Oakland can expect to live 9 years fewer than residents of other parts of Oakland. As recipients of federal funds, the City and Port of Oakland have an obligation under Title VI of the Civil Rights Act to avoid causing an unjustified unequal impact on the basis of race, and to consider the risk of unequal impacts before approving a project. If the Department of Transportation and the U.S. Environmental Protection Agency accept the complaint, they will initiate an investigation into the actions from the City and Port of Oakland affecting the community in West Oakland. Since the closure of the Oakland Army Base in the late 1990s, the City of Oakland has been disingenuous about its plans to expand the polluting freight industry, and while it has had the opportunity to use measures to relieve the terrible impacts on West Oakland’s air the City has consistently refused to do so. However, zero emissions electric vehicles and equipment to relieve community health problems are available and in use at other ports and freight hubs in California and the nation. Instead, the City has manipulated its approval processes to circumvent or disregard the disproportionate and toxic burdens West Oakland faces as a result of the Port’s extensive freight operations. 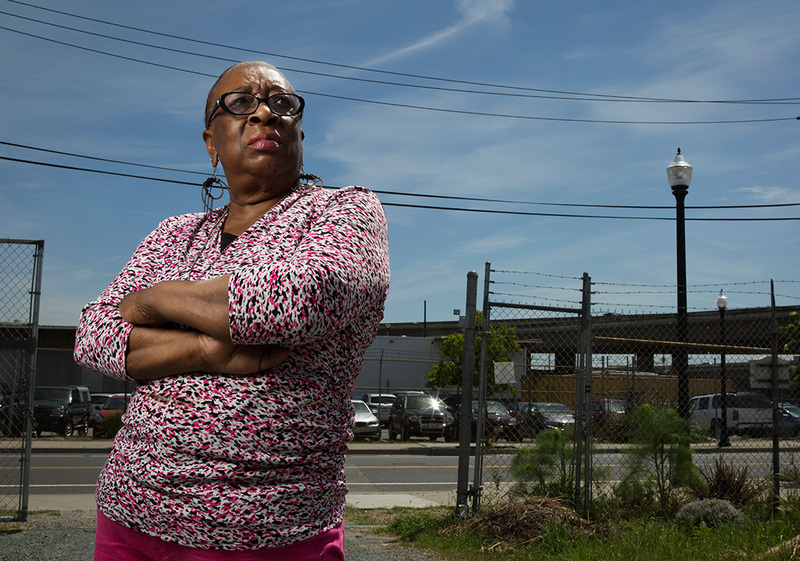 In October 2016, the City of Oakland gave approval for developer Prologis to break ground on a massive warehouse at the Oakland Army Base without an air quality plan to lessen health harms for the community. That project is expected to bring a flood of new trucks rumbling through the area, with plans including 250,000 square feet for cargo, 55 trucks docks, and 78 truck trailer parking stalls. West Oakland has a rich culture and history as a black community, and has been a hallmark of Oakland’s historical narrative. As Oakland experiences dramatic changes in the demographic composition of many of its long-standing residents, the community of West Oakland remains a community of color. Roughly 49 percent of West Oakland residents today are Black, 17 percent are Latino, and nearly 13 percent identify as Asian.